Dhaulagiri Trek Archives - Panorama Trekking Pvt. Ltd.
Its name means “White Mountain”: towering in solitary splendour, this magnificent peak rises as a giant shoulder of shining ice and snow. Dhaulagiri is rarely visited and the valleys and villages surrounding it are unspoiled and unchanged. Our trek takes us across the kali Gandaki River and then north into the heart of the massif; from the base camp we come to the high point of our trek, the traverse of French Pass (5,360 m), the hidden Valley and Dhampus Pass (5182 m), a high level; route which brings us back to the upper Kali Gandaki Valley in Jomsom. From here we, either, fly back to Kathmandu via Pokhara or we can continue from Jomsom till Birerthaqnti or to Pokhara.This remote and challenging trek for the more adventurous walker circles Dhaulagiri, the seventh Highest Mountain in the world. Its name means “White Mountain”: towering in solitary splendour, this magnificent peak rises as a giant shoulder of shining ice and snow. 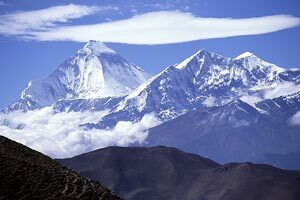 Dhaulagiri is rarely visited and the valleys and villages surrounding it are unspoiled and unchanged. Our trek takes us across the kali Gandaki River and then north into the heart of the massif; from the base camp we come to the high point of our trek, the traverse of French Pass (5,360 m), the hidden Valley and Dhampus Pass (5182 m), a high level; route which brings us back to the upper Kali Gandaki Valley in Jomsom. From here we, either, fly back to Kathmandu via Pokhara or we can continue from Jomsom till Birerthaqnti or to Pokhara. Duration: 22 days in Nepal |18 days camping trek | 4 night in Kathmandu.